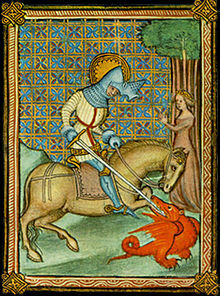 Compared to the various versions of our peripatetic Reynard the Fox, Jacques de Voragine’s Golden Legend, which contained the story of “St George and the Dragon,” has not endured or is currently dormant. Yet, it was the bestseller of the Middle Ages, a period during which hagiographies, i.e. lives of saints, St George in our case, were very popular. In the sixteenth-century, Renaissance scholars such as Erasmus (28 October 1466 – 12 July 1536) and Georg Witzel (b. at Vacha, Province of Hesse, 1501; d. at Mainz, 16 February 1573) found the Golden Legend too fanciful. It therefore went out of fashion. But times have changed. Among incunabula (an incunabulum is a work printed before 1500), the Legenda aurea was printed in more editions than the Bible. It was one of the first books William Caxton (ca. 1415~1422 – ca. March 1492) printed in the English language. 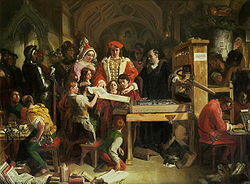 Caxton’s version appeared in 1483 and his translation was reprinted, reaching a ninth edition in 1527. In 1481, two years before he translated and published the Golden Legend, William Caxton had translated and printed Reynard the Fox. Voragine (Italian: Giacomo da Varazze, Jacopo da Varazze (c. 1230 – 13 or 16 July 1298) was archbishop of Genoa, a chronicler and, more importantly, the author of the Golden Legend also entitled Legenda aurea (Golden Legend and Lombardica historia). Jacopo became a Dominican in 1244. He was the prior at Como, Bologna and later in Asti. But his reputation as preacher and theologian soon led to his appointment as provincial of Lombardy (1267–1278 and 1281–1286). He represented his province at the council of Ferrara (1290) where he was one of four delegates who conveyed Nicholas IV‘s desire for the deposition of Munio de Zamora. Muno was deposed on 12 April 1291. Remember that thou art a Ghibelline, and with thy fellow Ghibellines wilt return to naught. Jacopo died in 1298 or 1299 and was buried in the Dominican church at Genoa. He was beatified by Pius VII in 1816. His feast day in the Dominican order is July 16th. The Golden Legend includes “events in the lives of Christ and the Virgin Mary, information about holy days and Season the whole arrange as readings (Latin: legenda) for the Church year. Immensely popular in the Middle Ages, it was translated into all western European languages and gradually much enlarged.”[ii] Voragine kept enlarging it until 1260. Voragine’s works also include sermons on Gospel readings, saints’ days, and the Virgin Mary, as well as a chronicle of Genoa. It appears that Petrus Comestor’s History of Scholasticism was also a favorite among Medieval readers. But the Golden Legend was the bestseller. [i] “Jacobus de Voragine.” Wikipedia <http://en.wikipedia.org/wiki/Jacobus_de_Voragine>. [ii] “Jacobus De Voragine.” Encyclopædia Britannica. Encyclopædia Britannica Online. Encyclopædia Britannica Inc., 2012. Web. 05 Feb. 2012. <http://www.britannica.com/EBchecked/topic/299131/Jacobus-de-Voragine>.